Today we are interviewing Eric Arnow, writer of the bumblebuddhist blog. I find myself in a 66 year old body, born of an American Reformed Jewish family, majored in German literature. After graduation in 1970, I fulfilled my aspiration to study Zen at the San Francisco Zen Center, where I had lived, worked and studied after college. In 1984, I decided that I needed to learn about how money worked, and went into the life and health insurance business. Worked in that industry for about 18 years. I got tired of that, and In 2004, went to Thailand, where I felt freer to pursue meditation practice. I stayed at many temples in Thailand, Burma, and eventually, starting in 2010, many Chinese Buddhist temples and monasteries. Following successive financial crashes, 2000 dot com crash, recession in 2003, crash in 2008, commodities crash 2011-the present time, I decided to get into the ecommerce business, to shore up my finances. What sparked your interest in Zen and Buddhism? In Chinese, there is a popular term, Yuan Fen. It is often translated as Destiny, Fate. Or alternatively, Affinity, or perhaps Synchronicity. At the age of 9, I, a kid from a typical middle class family, was watching a dramatization of a party. There was a guy who looked different from the people I was used to seeing. He had a beret, a beard (Unthinkable in 1950's America! ), was waving a funny looking cigarette, and talking about 'Zen'. I had no idea at the time, but he was what was being portrayed as a 'Beatnik'. I thought, "What's Zen????. Five years later, I wandered into a corner store, for a treat, was gazing at a paper book rack with dime novel. But there was a book "Zen Flesh, Zen Bones". I thought, THERE'S THAT WORD!. I bought the book and loved it. When I went to college, I was majoring in German, and found that many of the writers and even scientists, like Heisenberg and his Uncertainty Principle, were raising fundamental questions about life and society. My country was in the process of destroying Vietnam, my family had many problems, too. So I decided that the wisest course to take was to stop, take stock of my own life. A Zen community in San Francisco offered a way to do that, without having to deal with the 'dog eat dog' world that I saw as the usual life path. So I took it. You've done a lot of traveling through Asia. What are some of the places you've traveled to? How did you select these places? While many people assume (maybe, if they scratch the surface of the word "Zen") that Zen is a Japanese thing, in fact, Zen developed in China, especially from the 5th-12th centuries. Having read about the places where Zen developed, I had the idea that, to pay my respects to my 'spiritual ancestors', I needed to go, first to Thailand, where Buddhism in its earlier form is still practiced, but more importantly, to the historical places where Zen actually developed. Where the teaching stories, called Koans, actually occurred. In other cases, because I have an affinity for China, I visited places that are famous from a cultural point of view. In 2010, I visited (and a shout out to Author and Translator, Bill Porter, aka Red Pine, who introduced me to the Abbot) the 4th Ancestor temple, ( Chinese: Si Zu Si). From there, learned of other places to visit and stay. In 2012, I also visited the most impressive caves in Gansu Province, at Dun Huang, and associated places, famous for their cave art. In 2013, I did a pilgrimage of the most important Zen (in Chinese, it is called Chan) Temples, most famous in the development of Chan or Zen Buddhism: Yang Shan Xi Yin Temple, Dong Shan Temple, Huang Bo Temple, Baijiang Temple, Gao An, Linji Temple, and several other important but lesser known temples. Also climbed two of the 5 Mountains Sacred to Chinese Buddhists: Wu Tai Shan " Five Plateau Temple", and Jiu Hua Shan, Or Nine Precious Temple, which was home to a famous Buddhist Saint, called Earth Store Bodhisattva, or in Chinese, Di Zhang Pusa. To a lesser degree, I also visited some of the more noteworthy places in Beijing, such as the Emperor's Forbidden City, and various other tourist sites. I'm sure the knowledge and wisdom you've gained from your travels are invaluable and voluminous. What are a few of the things that stand out the most when reflecting on your traveling experiences? On a social level, I have been totally moved by the kindness and helpfulness and friendliness of Chinese people to me. Everywhere I went, people went out of their way to help me. And families often took me in to stay with them. Temples were very happy to let me stay with them. Sometimes, after I gave them a donation, they would give me a donation! Another thing I feel is the sense of Culture. Chinese are very aware that they have an ancient culture. They often ask, "do you know about Chinese culture?" 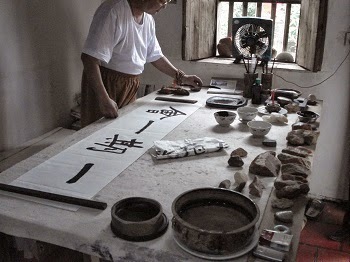 People practice calligraphy with Chinese characters. 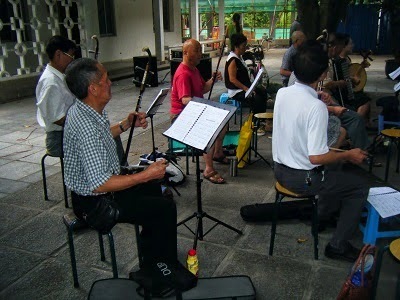 Many practice musical instruments, even the ancient Chinese instruments, like the Gu Qin, or flute. What do you have planned for your next pilgrimage? In your blog, Bumble Buddhist, you document a lot of your travels. Do you have any plans to further share about your studies and travels in a book? As noted, I have a blog, which I contribute to, though not so much recently. Indeed, people have encouraged me to write a book, and much of the material for it is already written on my blog. It just needs to be organized and edited. What advice do you have for someone interested in Buddhism? Buddhism is not a belief system, really, but a way of seeing and being in the world. 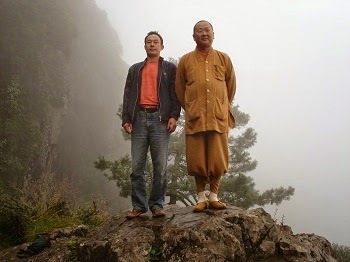 A famous Japanese Zen Master, who brought Chan back from China to Japan, said, "To Study Buddhism is to study the Self. To study the Self is to forget the Self. To forget the Self is to be Enlightened by all things." The Buddha, who lived 2500 years ago, said, "All we are is a result of what we have thought". And another Chan Master, who had an exchange with a provincial governor over 1000 years ago had this to say, in response to the question, what is the truth of Buddhism. "Do good, do not do bad, purify your mind". The governor responded, "Well, any 3 year old knows that! ", to which the master replied, "True, but how many 80 year olds can actually do it." Think about that story in the context of our current predicament. What government official nowadays would even consider such a conversation? On a practical level, there are many many books written both by modern Buddhist teachers and writers. A visit to the web along with some curiosity, will yield a lot of information. Youtube has many videos of talks by Buddhist teachers. Those are two approaches to learning 'about' Buddhism. But to really understand Buddhism and especially Zen Buddhism, you have to 'Just do it'. The Buddha himself was a crown prince, destined to be a world leader. He gave up the luxuries of the palace, and went to get answers to his most pressing questions. Eventually, he determined to 'just sit', quiet his mind---no easy task--- and allow the answer to unfold within. So I recommend that people practice meditation. Sitting meditation, but also, practicing Mindful Awareness as much as possible, throughout one's daily activities. All things pass quickly away!